Let’s start by defining acoustic guitars. We are referring to the traditional "steel string" acoustic guitars that are generally hollow with a sound hole or holes, as opposed to classical/flamenco guitars. These acoustic guitars transmit their sound by vibration when the strings are plucked or strummed. Based on the composition of the materials used, different manufacturing processes, and the gauge or tension of the strings, different acoustic guitar strings can completely transform the sound and the playability of the acoustic guitar. Rather than try to come up with an all-encompassing correct answer, let’s start with the correct question: What are the best acoustic guitar strings for you? Different manufacturing processes and the gauge or tension of the strings completely transform the sound and playability of the acoustic guitar. There are many different kinds of strings, so let’s look at the various types and then determine which will work best for your needs. What are acoustic guitar strings made of? Acoustic guitar strings are constructed using a wide variety of materials. With the exception of sets known as silk and steel and silk and bronze, which have a thread sheath around the metal core, acoustic guitars strings are made of some combination of metals. The material chosen has a dramatic effect on how the strings feel, play, and ultimately how they sound to the player and audience. Strings made of harder metals will have a brighter sound than strings made of a softer metals. What are Phosphor or 80 20 strings? These are some of the more popular acoustic guitar string sets that string manufacturers make. They are steel strings that are wound with different varieties of bronze (an alloy consisting mostly of copper and tin). Phosphor Bronze have phosphorus added to their bronze alloy. 80/20 Bronze have a specific mix of 80% copper and 20% zinc. They are both acoustic guitar string types that are known for their rich and full tones. The 80/20 Bronze strings are a harder material, so they will produce a somewhat brighter sound than Phosphor Bronze strings. What acoustic strings are darker or brighter sounding? Are any other materials used? 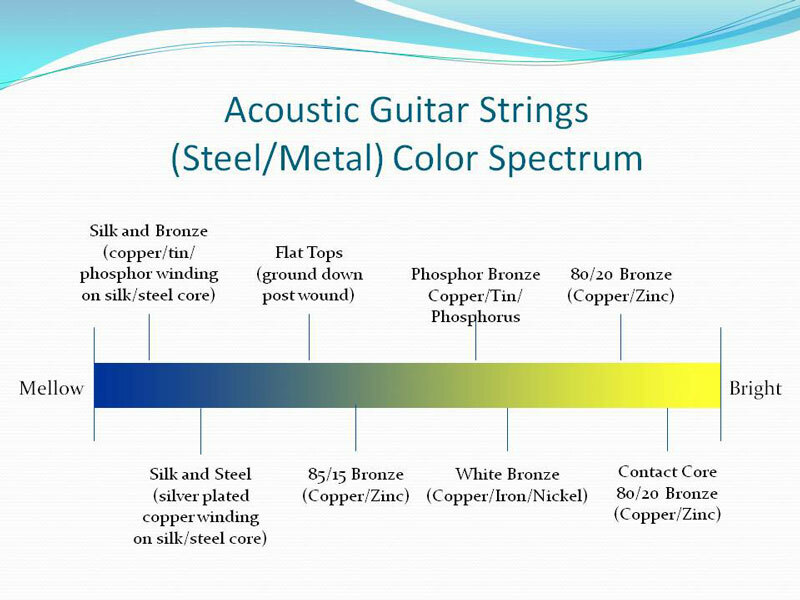 There are a variety of other metals that are used in the construction of acoustic guitar strings, which help produce unique tonal qualities that many guitar players enjoy. Gold Plated and Gold Alloy acoustic guitar strings are somewhat more expensive, but the superior qualities of the gold help to make very long lasting strings with exceptional tonal qualities. Nickel Wound acoustic guitar strings are a popular choice for players who would rather hear the natural woody sounds of their acoustic guitars. Other types of acoustic guitar strings incorporate different materials into their core wires, such as silk and steel and silk and bronze, which help produce a more sweet and mellow tone, with a softer feel for easier playability. 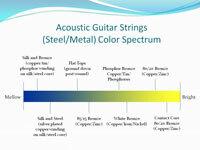 This chart shows where the different types of strings lie on the spectrum from bright to mellow sound. What is the difference between roundwound and flatwound strings? Most often, the outer windings of wound acoustic guitar strings are called Roundwound, which consists if a round outer wire, tightly wrapped around a round or hex-shaped core wire. In contrast, Flatwound strings sit a little more flat in comparison to the roundwound strings, offering a slightly lower profile and a more comfortable playing experience with the strings being closer to the fretboard. They also create less noise of fingers sliding on the strings. Are those the only differences in strings? No. Additional wrapping or finishing processes can also be applied during acoustic guitar string manufacturing. The strings can be further manipulated by grinding down or polishing the strings. With a three-step polishing process, Flat Top acoustic guitar strings provide a smoother playing surface that can help reduce finger noise with less sacrifice of the desired tone. Some acoustic guitar string manufacturers utilize various coatings and treatments to the strings to help protect them from oxidation, dust and dirt, as well as from the natural oils from the player’s fingers. These Treated and Coated acoustic guitar strings also help the strings and their tone to last longer; however, they may seem slightly more muted and somewhat darker in tone when compared to uncoated strings. What is the difference between light and heavy gauge strings? Another major factor that differentiates acoustic guitar strings is their gauges (or tensions). These string gauges are most often listed on the package, making it easier to compare with other acoustic guitar string sets. String gauges are typically written out from the 1st string to the 6th string (when dealing with standard 6-string sets). An example set of acoustic guitar strings might be listed as .013 to .056. Many times every string gauge is detailed on the package along with the associated category of the gauge: Medium Heavy – .013, .017, .026, .034, .045, .056. Some other string gauge categories that are often seen are Extra Light, Light, Medium, Heavy, as well a number of other in-between or custom gauge sets that some string manufacturers provide to meet the varied needs of their customers. So what gauge should I use? While heavier gauge strings with higher tensions require a little more effort to play, they give a louder, more focused punch to the sound. The lighter gauge strings help provide a lighter touch and sound, and are easier to play and more gentle on a player’s fingers. Can I mix and match string types? Should I? Yes. And it’s up to you. Here at Strings By Mail, we provide our customers with many "individual single strings", so you can easily replace one string at a time, or create your own custom acoustic guitar string set – like our Custom Customer Concoction (C3) String Sets. The wide assortment of acoustic guitar string choices available from Strings By Mail helps to provide a huge variety of sound and playing options for acoustic guitar players across the world. Give us a call if you need some advice from our knowledgeable Customer Service Representatives. We are guitar players too, and more than happy to advise and help you find that perfect sound with a new set of strings for your acoustic guitar. Why should I change my strings? Acoustic guitar strings do not last forever! They begin to deteriorate over time from being played, as well as from oxidation from the string materials themselves. Fresh strings are essential in keeping your acoustic guitar sounding and playing as well as possible. Installing new strings, or selecting different string sets, is also a great way to experiment with your guitar’s playability. It also can dramatically change the sound potential of your acoustic guitar. Obviously, the more you play, the more you should change your guitar strings. However, an un-played guitar’s strings will also naturally deteriorate over time. This chart offers a guide to how frequently your strings should be changed. How do I change acoustic guitar strings? The following video will guide you through the steps of changing guitar strings in a quick and precise manner. What If I'd Like to Learn More?